Would You Let Someone Use Your House But Not Your Boat? Is Boat Swapping For You? Would You Let Someone Use Your House But Not Your Boat? I get it! I do, my boat is my salvation to freedom, brings me pure inner peace, not to mention, my boat is part of my identity. My house on the other hand….well that’s just a place I keep all my precious belongings, raised my children, shelters me from the elements and where I spend 90% of my time, sure strangers can stay there anytime. Yea but hands off my boat!!! Fine I will think about it..
Ohh so when I go to Greece I can use their boat if I let them use mine in Florida? Hmmm I suppose if they have a boat they must know how to operate one and will take care of her. Actually it might be cool to have a native show me around. If I do, big IF, where do I go to register my boat? Boataffair has boat owners in 7 countries who are looking to share their boat in this way, without renting it out. BOATAFFAIR: Daniel, thank you so much for talking to us. Can you tell us a bit about yourself and your background? DANIEL: I’ve always had a boat. As a kid I learned to sail with my dad then went on to sail with friends my own age, then later had my own dinghies and trailer sailers. Only recently did I make the move into blue water yachts by buying Ishka in 2010. 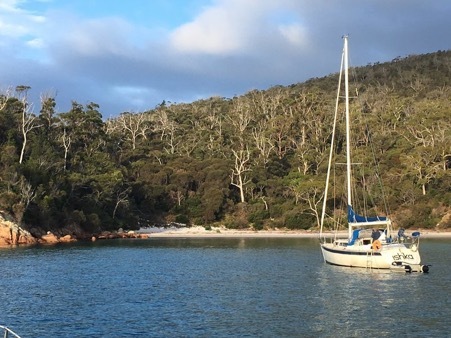 Since then I’ve sailed with my partner and friends up and down the east coast of Tasmania, around the south coast to Port Davey, up into the Furneaux Group in the feared Bass Strait and a couple of wonderful experiences in theWhitsunday coast of Queensland. BOATAFFAIR: When did you go into sailing and what is it you enjoy most about it? 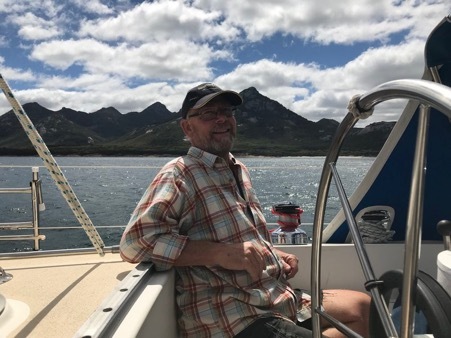 DANIEL: Probably my favorite thing with sailing is the pure animal pleasure of helming a sailboat: the wind singing in the rigging, the ocean curling off the bow and the boat responding to the push of the wind and waves and my hand on the wheel. Then there are the times at anchor, sharing the end of the day with friends: a meal, a drink, swapping stories and maybe games. These are quite precious. BOATAFFAIR: What are the primary traits or transferable skills a person learns when they learn and keep up sailing? DANIEL: Sailing is an art that teaches respect for the sea.There is nothing quite like reading the wind, the sea state and the passage options, making your choice and then adapting and seeing your plans through. Sailing teaches and demands self sufficiency, determination and resourcefulness. As new situations and challenges arise, so one has to work out solutions and implement them, making do with the tools and resources at hand. BOATAFFAIR: Why do want to share your yacht with others and what do you hope to get out of it? DANIEL: I have been in a boat swap arrangement in Australia before and have had wonderful experiences and made lasting friends. Boat swapping allows you to sail in wonderful new locations, with the added bonus of being able to do your initial research with someone who knows the location and the boat intimately. This means that you are likely to have the very best experience that you possibly can. On top of this is meeting and getting to know the boat swapper. Typically, you will hit it off quickly with your colleague because of the shared values and enthusiasm. And because there is a high level of trust involved, this deepens the relationship. BOATAFFAIR: Why did you join Boataffair and our boat swapping scheme? DANIEL: Many people around the world now have wonderful assets which they have loved nurtured and stamped with their own unique personality. Swapping, be it boat or house, enables people to have authentic and endearing adventures whilst keeping the costs close to travel costs only. I have recently retired and thus have an enhanced ability to take advantage of opportunities wherever and however they arise. I am hoping that I will be able to travel to new destinations and have fantastic experiences that would otherwise be cost prohibitive. Along with this is meeting like-minded people and developing new friends. On the flip side of this, as boat swapping is a cooperative activity, it means that people will come to your home port and you will get to share your knowledge and love of place. BOATAFFAIR: What would you tell someone who wants to join the boat swapping scheme but is not sure yet? What is your argument? DANIEL: Probably the most difficult thing to overcome is trusting people with your beloved boat as boats are so much more individual than cars or houses. But although this is difficult, it also has its upside as this can lead to a deeper relationship with your boat swapper. I guess another challenge is having your boat in tip top shape and developing a user manual. That does provide the opportunity to do all those pesky little jobs that you have been meaning to do! BOATAFFAIR: Any comments or other statements you would like to make? DANIEL: Think about the assets that you have: boat, house, car(s), maybe a holiday house, and how these can be shared with other people. Swaps needs not be contemporaneous but can occur at the best time for the area that the swap occurs. This is just another aspect of the sharing economy, where the middleman is just a facilitator, with the bulk of the benefit accruing to the participants. BOATAFFAIR: Thank you so much Daniel for speaking with us. It is such a pleasure to have you onboard and we wish you many boat swaps!